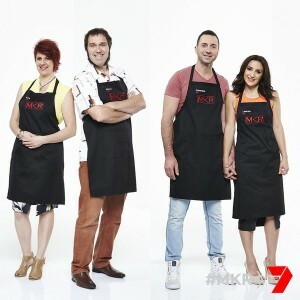 MKR elimination tonight is between Carmine & Laurent and Jason & Eve. Who was eliminated from My Kitchen Rules? Let’s find out! The teams have 1 1/2 hours to serve their entrees. Carmine and Lauren are making tortellinia in brodo for entree, beef brisket with mushy pees and roasted bone marrow for main and apple crumble tart with cinnamon ice cream for dessert. Both teams get straight to work. Lauren says she’s not using anything from a jar today, they put their broth on to start cooking. Eve gets on their stock and Jason starts on gnocchi. Lauren gets the brisket prepared, she puts them in pressure cookers, they are a bit concerned that they won’t be able to see it cooking while it’s in there. Eve starts Frenching the lamb cutlets, hoping it will show the judges some technique. Carmine starts on the pasta for the tortellini, but the peanut gallery think the pasta is a little thick. Jason’s gnocchi isn’t looking good, he’s mixed cheese in but it’s been grated too thick. He’s tried to melt it down on the stove in a pot rather that re-making it. He’s happy with it. He pipes them into water, when they float to the top he takes them out and puts them in ice water. When they are all cooked he puts them in a pan with some butter. Both the teams start plating up. Both dishes look good and they’re brought out to the judges. 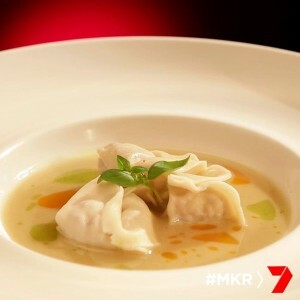 The first dish to be tasted is Carmine and Lauren’s tortellini in brodo. Colin says this entree says ‘clumsy’ but when he tastes it, it has good flavour. Liz agrees. Guy likes that there are different meats in the filling, but the tortellini is too thick, Pete agrees. He says he would have liked it if the tortellini was the star. Next up is Eve and Jason’s choux gnocchi. Guy says there is not a lot that is positive to comment on. Colin says the gnocchi is rock hard. Karen doesn’t understand the concept, there is nothing “spring” about the vegetables. Manu says they are vegetables you can find all year round. Liz says it just hasn’t worked for them. At this point, it’s not looking good for Eve and Jason in this elimination. The teams have an hour for mains. Lauren get their bone marrow in the oven and checks on her jus. It’s too salty, she adds sugar but over compensates, making it too sweet. Meanwhile, Eve and Jason get their lamb ready and into the oven. It’s a bit early as it is only a small piece of lamb. Jason gets onto the vegetables, he cuts the beans, but he is taking forever. Eve and Jason get their lamb out, its cooked perfectly. Carmine notices their oven is on grill, it has the bone marrow in, he turns it off grill and hopes it hasn’t affected the cooking. They take their brisket out, it’s cooked. With 10 minutes to go, Jason is madly passing the parsnip puree through a sieve, but there is not enough. With 4 minutes to go he has to blend some more. Eve gets the plates out and starts preparing the cutlets. Carmine and Lauren start plating up. It’s a rush to the end, but both teams finish on time. The first dish to be tasted is Eve and Jason’s lamb cutlets. Colin says the lamb is cooked to perfection. Liz says the parsnip puree has great depth and a good flavour. Karen thinks there needs to be something special on the plate but there isn’t. Next up is Carmine and Lauren’s beef brisket. Pete says it’s delicious. Guy wishes he had more of the sauce, but it was a bold dish, the brisket was full of flavour. Colin says it is his type of food and Karen says it was delicious. It’s on to desserts, the final course of the evening. Lauren and Carmine are preparing their apple crumble tart with cinnamon ice-cream. Lauren peels her apples and places them in the oven. The ice-cream has been quenelled and now Lauren is rolling out the pastry for the tart. Eve is working on the citrus curd for their dessert. Lauren is trying to fill the pastry cases but it’s not working for her. She is really struggling and the time is running out. Jason is making a crumble for their dessert. Lauren lets Carmine help her with the pastry but it is still not working. There’s only 18 minutes on the clock and time is running out. Lauren finally manages to get the pastry in tart shells and gets the tarts in the oven. Lauren takes the shells out of the oven and one breaks as she takes them out of their cases. She had some spare tarts so she quickly pops them into the oven. Both teams start plating up their dishes. As Carmine takes the extra tarts out of the oven he breaks one. The tart is not cooked but they take it out and try to plate it up anyway. Both teams get all their dishes onto the plates. It’s time for the judges to taste. The first dish the judges taste is Eve and Jason’s. Guy says the dessert looked a bit sparse but he liked the delicate and light flavour of the cheesecake. Karen really likes the dish. Liz says it’s quite delicious when you put it all together. Manu says you can’t judge a book by its cover. Next they taste Carmine and Lauren’s dish. Karen says it looks very simple. No other judges comments are shown. It’s time for the judges scores to be revealed. 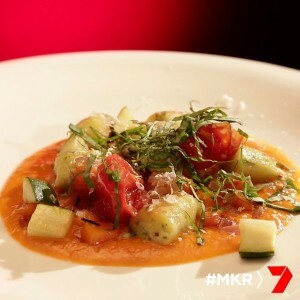 Eve and Jason have been eliminated from MKR tonight.